Whether you prefer the timeless appeal of a wood fence or the privacy of a chain link fence, ordering them from Hercules Fence in Gainesville, Georgia, will give you great value for your money. You may also be interested in adding a gate to your fence selection. Otherwise, if you need help in deciding on the type of fence to purchase, please read on. We offer chain link fences in various heights. A type of woven fence with a diamond pattern, the chain link fence looks great in both residences and commercial establishments. For more privacy and security, we can add vinyl slats and barbed wire upon request. There are two types available: galvanized and vinyl coated. Galvanized chain link fence is distinguished by its shiny appearance, which comes from zinc coating used to reduce corrosion. Vinyl coated chain link fence, on the other hand, is made of steel wire and is available in different colors. Unlike galvanized, our vinyl-coated fence is less corrosive and therefore lasts much longer. Picket - Available in a variety of designs and sizes, this classic variety consists of evenly-spaced vertical boards and horizontal rails. Privacy - Also known as stockade fences, this type looks similar to picket fences and also comes in various designs and sizes. It offers more privacy because the vertical boards are placed closer together. Split-Rail - Used for agricultural or decorative purposes, the split-rail fence is built with vertical wood logs. For added security to customers with kids or pets, we can add wire mesh upon request. Offered in various styles, this type of fence is designed to look like wood. 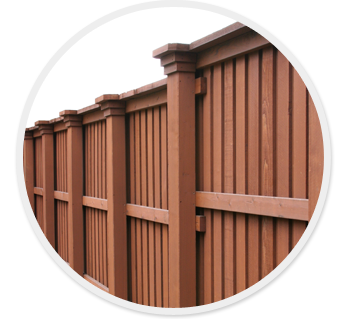 But unlike wood fences, PVC requires almost zero maintenance, and its long-term cost is lower. PVC also always looks new, no matter how long you have been using it. We can install PVC or vinyl fences in picket, privacy, or split-rail method. Wrought Iron - Made of traditional material, it is strong and durable. We can customize them to meet each customer's preference. Tubular Aluminum - This variety looks similar to wrought iron. Since it is lightweight and resistant to corrosion, it is a popular choice among customers.